Join the movement. Together, we can reduce poverty. Becoming a Brands for Canada volunteer is a life-changing experience. It’s a movement where everyone can help, everybody wins, and everybody can be a part of something bigger than themselves. Volunteers are the backbone of Brands for Canada. 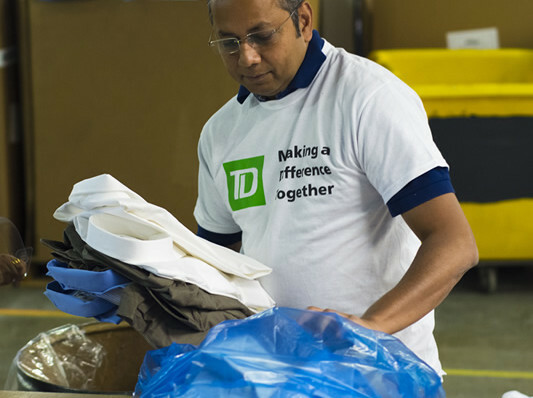 From helping our warehouse team sort clothing, to assisting at events, to spreading the message, our volunteers – people like you – continue to make a significant difference in thousands of people’s lives. Brands for Canada eagerly welcomes groups of volunteers from corporations. We offer half and full-day experiences that can build your team in a fun and meaningful way. You’ll help sorting and packing items, assisting with preparations for special events and other fun and meaning initiatives. To organize a day for your team, please call our offices or email Tria Urnom at tria@brandsforcanada.com. Teach the value of giving in the best way possible. By giving. We welcome groups of students from middle school, high schools, colleges and universities for volunteer days. For high school students, we offer volunteer hours that can be used toward their 40-hour requirement for graduation. We also accept college and university students for co-op placements year-round. It’s not just the recipients of our donations whose lives are made better. We often hear from our volunteers that doing something that helps vulnerable people create a better life is a rich and life-changing experience. If you would like more information about organizing a day for your school or a student placement, please email Tria Urnom at tria@brandsforcanada.com. Take Action. Make a donation. There are several ways to contribute to Brands For Canada. We need money to operate as well as new clothing and basic-needs items for our programs.